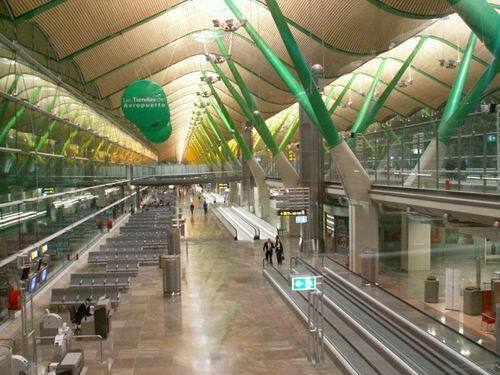 When Barajas Airport Terminal 4 building was opened in 2006, it effectively doubled the aircraft and passenger capacity at Spain's largest international airport. Not only was there another major terminal building (two actually as there's also a smaller satellite terminal building, T4S), but another two runways were added. Now aircraft take off and land during the day at an average rate of one every 30 seconds. Barajas was a sleepy little town situated close to Madrid when in 1928 a 330 hectare piece of land close by was designated to be the new airport for Spain's capital city. It was opened in 1931 and called Barajas-Madrid Airport. The runway was made of hard compacted soil. It had a large white circle was painted on it with the word, "Madrid" as the only navigational aid for pilots. The airport has changed a lot from its humble beginnings. Terminal 4, officially opened on February 5th, 2006, ranks as one of the world's largest airport terminals, measured by building area. The airport as a whole is the 4th largest in Europe, and the 10th largest in the world. Terminal 4 is striking in its appearance. It was designed by Antonio Lamela and Richard Rogers. The award-winning design attempts to use its sweeping visual effects to psychologically create a stress-free feeling among passengers prior to their journey. There is much use of glass panels and ceiling domes that flood the areas below with light. The whole effect is one of pleasingly accordant fluidity. There are several hotels located near the airport, and many of these offer free shuttle services, allowing travellers quick access to 1-night hotel stopovers if necessary. Terminal 4 handles mainly international flights. It serves much of the European countries, as well as the USA, Central and South America, and a number of Middle Eastern Arab States. The terminal handles around 35 million passengers a year, which is more or less half the total number that flows through Barajas-Madrid International Airport every year. The numbers are growing steadily, but Terminal 4 is not in any danger of exceeding full capacity yet. From Madrid, Terminal 4 can be reached easily via the city's Metro system. From Nuevos Ministerios, Metro line number 8 you can travel to all of the airport's terminals. The journey takes a little less than an hour and stops first at Terminal 2. It then continues on to stop at Terminal 4. Other transport options to get downtown are described here. Passengers wishing to connect between Terminal 4 and Terminals 1, 2 or 3 should walk outside the building and follow the signs to the Shuttle bus. These green buses leave every 5 minutes during the day, with a connection time of around 15 minutes. The journey is free. You can check in for all flights on the second floor of Terminal 4. Aircraft boarding takes place either from the main Terminal 4 building, or from the adjacent T4S building. An automated shuttle train runs between the two. The gates of zones H, J and K can be found on Terminal 4's first floor, while the gates for zones M, R, S and U are to be found in T4S. Both of Terminal 4's buildings share the baggage claim carousels numbers 10 and 11 on the ground floor of the main Terminal 4 building.